The Toyota 86 is a popular sports car. Of course, that's partly due to performance. Any sports car should really be able to revv up and peel out. But the Toyota 86 is packed with great, comfortable interior features, too. Suede-style Granlux trim is added to the interior of this car to add a touch of class. It adds a touch of sophistication and a texture that feels great. Are you looking for a small vehicle with a lot to offer? Are you ready to get into a subcompact car but you want to make sure that you don't make any sacrifices while doing that? The Toyota Yaris is a popular subcompact car and it is set up with technology that will make every ride fun. Some of the nice interior features in the Toyota RAV4 include several speakers throughout the vehicle that deliver a prolific sound. These speakers go along with the free satellite radio subscription that lasts over 12 months. There is also a standard AM/FM radio with a built-in CD player. 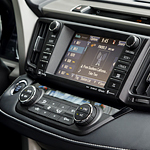 Another great interior feature in the Toyota RAV4 is the climate control, which can be easily adjusted by anywhere in the vehicle. All of the knobs for climate control can be easily found in the front and in the back. The Toyota Prius c is a hybrid vehicle. This compact hatchback is a great car for driving around in Lake Charles. It is a reliable vehicle that makes great gas mileage. 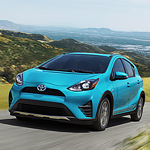 When the designers at Toyota designed the Prius c, they incorporated important safety features into the car. The Toyota Prius c is equipped with nine airbags. In an accident, the driver and the passengers will have protection to help avoid severe injuries. The Toyota Prius c also features brake assist. 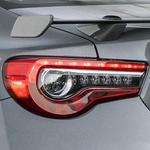 The brake assist feature works in cooperation with the anti-lock brakes. 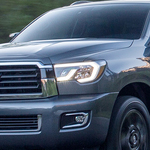 There are many reasons to love a full-size SUV, and for the Toyota Sequoia, its features are part of why it's so popular. Check out these tech features. We here at Lake Charles Toyota understand the importance of staying connected while traveling. 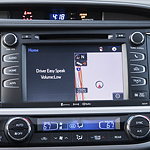 When you go on your next trip in your Toyota, the Entune helps provide you with the tools and information you need. What is Entune? This smart in-car technology is designed to help you stay connected. The Entune starts with an interactive touchscreen that can connect your Apple or Android device. 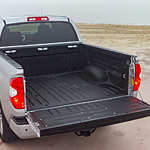 The Toyota Tundra is a popular full-sized truck with some great exterior styling. It offers all of the power you could want for work and hauling. It also provides all of the modern comfort you could want for long commutes or just daily driving. 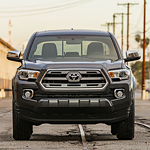 Toyota Tacoma looks good, and it's fun to drive, so it's a popular mid-size pickup truck. It also offers great performance and the strength to pull heavy loads. The Toyota RAV4 has always been highly sought after for its great safety ratings, fun design and affordability. The latest model of the Toyota RAV4 is also making waves for its innovative performance features that make you want to hit the road for your next adventure. Often what makes us take notice of a vehicle first isn't its performance or internals, but rather is its look and design. Like works of art, cars are designed with features and aesthetics that are pleasing to the eye. The 2018 Toyota Camry remains among the very best of midsized sedans by incorporating eye-catching features. 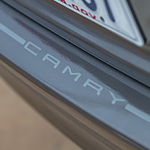 The 2018 Camry was designed with features to make those who see it take notice. These start with a new, muscular exterior design. This design incorporates a pleasant mix of curves and chiseled surfaces and includes an integrated spoiler and side rocker panels.